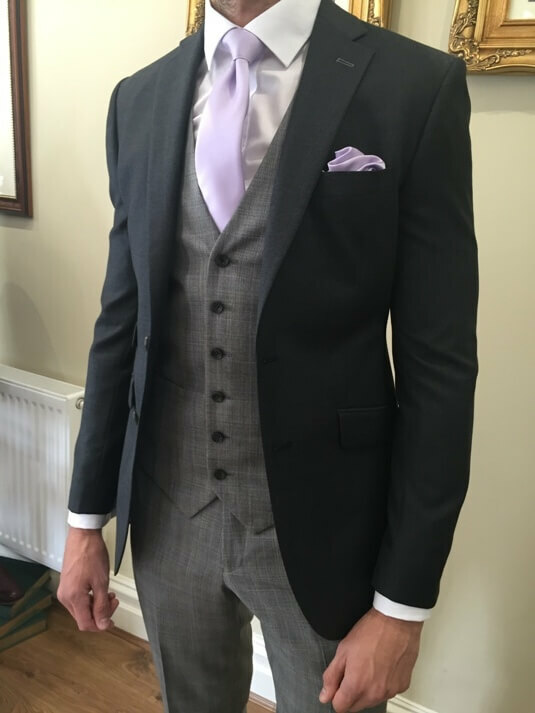 As a bespoke tailors in Manchester, we know that for a wedding or special occasion a three-piece suit is undoubtedly the go-to option for a ‘stand out’ look. However, rather than opting for a bespoke three-piece suit of the same colour, why not give it a distinguished edge by mixing and matching the colours and patterns of the jacket, waistcoat and trousers? There are few men on the scene who rival the style of model David Gandy, and one of his signature looks is a slick suit sharpened up with the use of a contrast waistcoat, jacket and trousers. He manages to look both dressed up and dressed down at the same time, but could never be accused of looking overdone. Obviously, this look does require a little more thought than just pairing random items together, and the key to success with this look is to consider tones and materials. Wearing one colour from head to toe is a classic look but it won’t give you the wow factor, why not mix patterns or checks with a solid colour. Different textures can work well too. 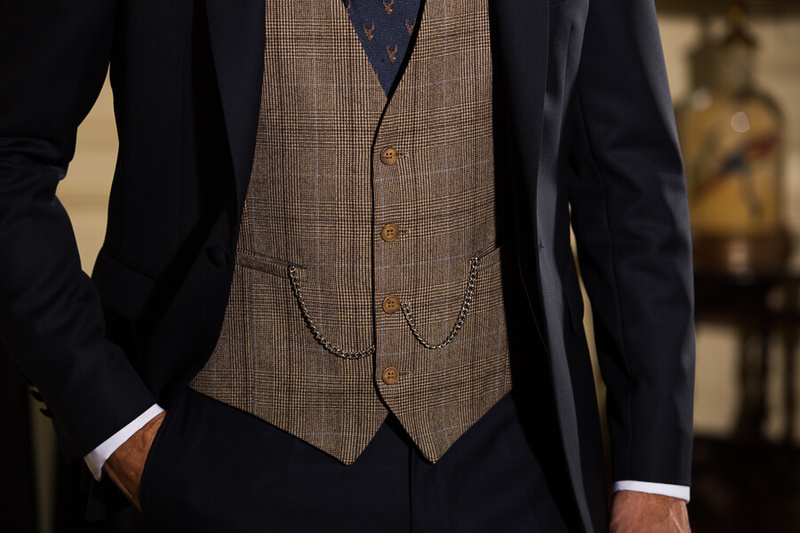 Changing your waistcoat is an easy way to experiment with how different colours and textures work together. One of our favourite mix and match hire looks is our Highgrove super slim fit suit in grey, light blue or navy with a tweed or check waistcoat. Adding a hint of pattern to a formal look like this gives an unexpected twist to the traditional three-piece suit look. Should you decide to go down the bespoke tailor route, you can be even more daring and chose the items you want to contrast. One option seen in the picture below is to go for a solid colour in the jacket teamed with check waistcoat and trousers. Or you can flip it with a solid colour in the trousers and contrast check jacket and waistcoat. To ensure you don’t look over the top, remember GQ’s perfect formula for mixing checked tailoring: ‘ one big pattern plus one small pattern plus one solid equals success’! The great thing about choosing contrasting colours and cloths is that you can extend their wear by pairing the separate pieces with other pieces in your wardrobe as well. If you want to try the mix and match tailoring trend, then make your appointment with us today. Based in Wilmslow we cover the whole of Cheshire and Manchester. We work on an appointment only basis as we want to ensure that we are able to give each customer our undivided attention. You can make your appointment by calling us on 01625 536 545 or by emailing us at contact@whitfieldandward.com.